When you decide get a tattoo, it is important to know where the design you want should be placed. By making your own tattoo stencils, you can temporarily try out your design to see where the tattoo looks best. Your own designs can be hand-drawn or printed on stencil paper and transferred onto your skin to create a guide for henna or ink tattoos. Take a piece of thermal stencil transfer paper, also called stencil paper, and remove the tissue sheet that is inside—leaving a top white sheet, a carbon sheet and a bottom sheet. Place your stencil paper on a flat, smooth drawing surface and use a ballpoint pen to draw out your design. Make sure to press down hard to transfer the carbon design to the paper. Tear the carbon and the bottom sheet off, leaving the top sheet. The back of the top sheet will also have a carbon copy of your tattoo design. Apply water or roll-on deodorant to your skin where you want your tattoo and press the tattoo stencil paper, carbon side down, against your skin. This will help release the carbon design to your skin. You can now apply a henna or ink tattoo right over your design. 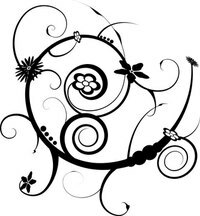 Choose a favorite clip art design or use a graphic design program to create your own line drawing. Print the line drawing for your tattoo on a piece of thermal stencil transfer paper using a thermal fax copier machine. A thermal fax copier machine uses heat to transfer the carbon design to the paper. Finish the tattoo stencil by following steps three and four from the instructions for a hand-drawn tattoo stencil above. Simple line drawings are easier to work with than fine, heavily detailed images. In case of skin allergies, first test the carbon ink on a small patch of skin.